5:57. 2nd defense. Suicide won with a twisting shooting sta press. 9:54. 3rd defense, 2nd on TV. Samoano was with the rudos and interfered freely. Earlier, Psycho Clown & a doctor announced Psycho couldn’t wrestle due to knee injury. Fantamsa revealed he’d gotten this changed to a title match and would have a surprise partner. Taurus appeared and attacked Psycho for a second time. Pagano, wrestling two matches in a row, was Fantamsa’s pick as partner – but Fantasma walked out on Pagano at the end of the match. (Fantasma teased a rudo turn all night.) Referee Piero stopped the match after Fantasma left with no clear ending. The camera cut backstage, where OGT & Poder del Norte got in a fight (PdN had beaten up OGT earlier), Fantasma & Psycho brawled, Pagano came back to fight Murder Clown, and the rest of the AAA roster tried to break up the fights. A masked MAD person (possibly Konnan) stood unnoticed backstage with a guitar. The opener is worth tracking down. The rest of the show was either not good, stuff being set up for Verano de Escandalo, or stuff that’ll be repeated on Verano de Escandalo when more people are paying attention. If you have time for only one AAA show this weekend, it’s definitely they Sunday one. The building didn’t appear completely full for an AAA taping in small-ish Arena Aficion. It wasn’t far off from being full, but this seemed like it should be an easy sell out as it has been in the past. It’s tough to get a read on the Psycho Clown injury bit. He didn’t seem all that hurt (and it wasn’t helped by Super Fly selling a knee injury much bigger a couple segments before.) Still, the angle they ran in the main event would’ve made a lot more sense with Psycho instead of Pagano, and Pagano wrestling twice felt like something they were stuck doing (though they still made a poor choice there.) I’d assume he’ll be fine on Sunday. He’s also doesn’t seem to be in a key position yet, so he probably should sit out if it’s actually serious. Taurus wearing an ELITE shirt for all his run-ins is probably going somewhere. Teddy Hart wore one in Tijuana, which came off like it was a fake out to hide him joining MAD later on in the night. Taurus too may end up in MAD, but it can’t be a coincidence he’s also reminding us of ELITE. Zona Ruda passes along a fun rumor: AAA may have bought the name right to ELITE and will be producing a show under that name for Azteca. There’s definite red flags with that rumor (is Televisa going to be happy with AAA producing a show for their rival network?) 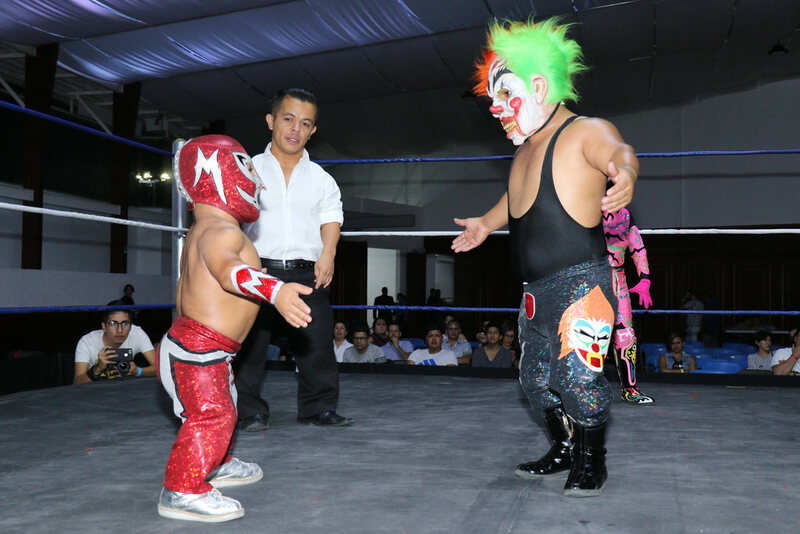 On the flip side, AAA’s roster has suddenly gotten a lot larger – all the kids working openers, all the people debuting at Verano de Escandalo, some more names that are said to be debuting soon but haven’t even been hinted at ye. Maybe they have more people to fill out two different promotions, setting up a WWE-like brand split. (AAA tried this idea once before, and it was quickly dropped.) It’s not the easiest logistical deal with a company who has very obvious problems with logistics, but it’s also a promotion who aspires for big plans without being all that concerned about how they might work. This is all based on a flimsy rumor that I wouldn’t put a lot of weight in normally and am still a little skeptical about now. This is suddenly a very weird time in lucha libre and It’s increasingly hard to rule out crazy theories. I do recall Konnan on Twitter pushing back hard on the idea that LA Park showing up in CMLL would outdo anything AAA could do. It seemed like hype, but something like this would be a LA Park level move for AAA too. LA Park himself main events Arena Mexico tonight once again. He teams tonight with his son, Hijo de LA Park, and Volador Jr. against Los Ingobernables. LA Park & Rush have teased having their mask versus hair match but have not yet formerly agreed to it. They may get that closer to it tonight; a press conference to announce it would make sense for next Wednesday, but CMLL hasn’t said they’d have one yet. Flyer appears to a better chance to show what he can do tonight the last week, teaming with Mistico & Caristico against Forastero, Sanson and Ultimo Guerrero. The rudos and the structure of the match fit more for a flying exhibition – unless Caristico & Mistico’s issues in Guadalajara carry over here. Cuatrero and Angel de Oro have their first singles match since their Homenaje a Dos Leyendas main event. Cuatrero has won the three singles matches they’ve had so far and would seem to be the favorite to stay the CMLL Middleweight champion. Angel de Oro told Reporte Indingo that, since Cuatrero seems to be breaking La Campana, he’s worked on a new strategy for tonight’s match. The singles matches between these two have beat expectations in the past, so this should be pretty good. The tercera has Hechicero, Rey Bucanero and Shocker against Niebla Roja, Soberano Jr. and maybe Diamante Azul. More on that in a few paragraphs. Puma & Tiger’s weekly segunda fiesta includes Okumura, Drone, Guerrero Maya and Rey Cometa this time. Astral, Electrico and Principe Diamante, a trio of ex-minis looking for a team name, face Disturbio, Metalico and Sangre Azteca in the opener. Lucha Central has a preview of the show. The show should air at 8:30pm on Facebook and Marca. It’s possible Marca may geoblock their show again. I’m probably skipping most of this show live, but I’m working on having a YouTube feed ready to go if needed. CMLL posted lineup updates this morning which remove Diamante Azul from all cards beyond today. He already missed Tuesday’s show in Guadalajara, so I’m skeptical he’ll even work this show. Soberano is now in the Saturday main event. Niebla Roja is on Tuesday in Guadalajara (so the feud with Furia Roja continues.) Atlantis replaces Diamante Azul on Father’s Day. This usually happens without explanation when Azul returns to France. CMLL announced Puebla’s Arkalis will get an Arena Mexico appearance on June 10th. That’s a Sunday show, so almost all of the people reading this will not be able to see it, but it’s a rare opportunity for a Puebla local. Arkalis fits in the “promising but rarely gets to show it” category. CMLL/ROH says the Atlantis/Maya/Delta trio will face So Cal Uncensored on 06/15 in San Antonio, and the Kingdom for the ROH Trios titles on 06/16 in Dallas. That means they couldn’t do a one day title switch. Flamita & Bandido were announced as heading to Dragon Gate this month. No date is mentioned. Flamita & Bandido are working in Mexico thru the 06/16 The Crash show, and disappear from lineups after them. (They were listed on a 06/30 show, but an updated card no longer includes them.) There was some question if Flamita & Bandido would be sticking with Dragon Gate itself or go to China’s OWE with CIMA, and this clears it up. El Hijo del Santo writes about “cuaz” matches; Arena Mexico used to have post main event singles matches with preliminary wrestlers, to get some people to stick around and make sure everyone didn’t flood out of the building at once. Lost in Lucha watches LA Park vs Fenix. DTU’s stop in ANLL’s home building – those are their luchadors in the 2nd and 3rd matches. No idea what will and won’t be taped for Powerbomb. (Black) Taurus returned to AAA, making multiple unexplained run-ins on the night. He attacked Lady Shani following the Faby Apache/Ashley match, attacked Psycho Clown in a segment explaining Psycho wasn’t cleared to wrestle tonight, and attacked Pagano at the close of his match with Murder Clown. Taurus wore an ELITE shirt during his appearances. Psycho Clown & doctor appeared in the ring during the show to explain Psycho Clown wanted to wrestle but was not being allowed due to a knee injury. Psycho was not heavily showing sign of a knee injury and it appears as if he’ll still be wrestling on Sunday. The rest of the show as building up Verano de Escandalo and TripleMania matches. The OGT did an in-ring promo solely to destroyed by Poder del Norte again. Shani attacked Faby Apache after her title match to continue the build towards TripleMania. Fantamsa argued with Psycho Clown and walked out on replacement partner Pagano in the main event (which ended with no finish.) The broadcast ended with Hugo as interviewer backstage, watching these people restart fighting backstage with the rest of the AAA roster trying to separate them. A masked MAD wrestler stood off to the side watching, very visible on screen but ignored by the other wrestlers. That was the old MAD live appearance. A vignette, implied to be from this show but clearly taped at another building, had Kross & Guerrera & masked accomplices harrassing workers at a show. A hype video for Kross aired, as well as the videos for Sammy Guevara and Darbin Allin shown recently. There was also a profile video of Drago. This lineup looked like a flashback to the AAA shows early this year and played out the same way: there was some really good stuff early, and the last few matches were not any good. The overall show seemed good for a while when watching it, though it doesn’t really hold up when I look back at everything. The main event was an ill considered way to end the night. Even if Psycho Clown was legitamately unable to wrestle, the fans had seen Pagano just wrestle for 15 minutes in an unimpressive fashion and weren’t eager to see him come right back out again. Pagano himself couldn’t seem to decide if he should be selling the previous match, and understanable didn’t have much to do in this match. I’m unsure why they made it a title match, since Fantasma walking out on just made those titles seem not that important. A non-finish is a really hard way to end a show too. Pagano/Murder Clown was a sloppy mess, with embarrassingly bad moments. Pagano is over with enough of the crowd and seems to be a made man in AAA, and no amount of bad matches are going to change how he’s being used. If this happened in a match where Pagano didn’t have that equitiy, he’d be mocked forever for the moonsault that missed terribly. Pagano’s not lazy when it comes to wrestling, but he just seems techinically poor at it. They gave these guys all the props they wanted to make the match workable, and they instead tended to just to find ways to make it less safe for them. This was exactly what it looked like it was going to be. The good part was it meant they wouldn’t be working with anyone else, but then the main event came. Vipers/Alvarados was the same match as the last taping, only with more chair spots. Máximo might have cared less too. I cared less. The crowd didn’t care at all. The Vipers are clearly trying to make a good impression on new management but suffer from not being all that good at this point in their career. It was obvious time filler match and it filled about 10 minutes. Same Dave/Parka trios match as always. There was some half decent stuff for the others, Dave not being much good, and Parka getting the win. This is a garbage feud that only exists to keep Parka happy. The OGTs put Poder del Norte at every occasion and it’ll look like a bigger win for Averno’s trio for it. Parka beats Dave the Clown pretty much all of the time, so he’s really just locked himself into a feud with a loser. At least it was short. Australian Suicide & Lanzelot’s rematch wasn’t near as good as their first match. They seemed sloppy at times – the moonsault that was blocked but not sold as blocked was no good – and the level of the action wasn’t as good as previous matches. There were a few ok spots but it was overall a disappointment. There were far worse matches on this show, but these guys have had better matches at pretty much every taping. Ashley’s weak dropkicks were a rough way to start of her title match with Faby Apache. It got better, and Faby gave Ashley a lot more than she had to. The crowd just didn’t buy into Ashley at all, and weren’t much into this match. Faby’s one of the best of the world and looked in this match, so there was no way it was going to be bad. It still didn’t work as well as it given the long lead up. The mixed tag match was probably the best these two teams have had, a borderline good match that made the most of what they could do, and unexpectedly was the second best match on the show. It’s not an exceptional lucha libre match but it was perfectly fun one with more wrestling than they’ve done in the past. It had the comedy of the previous matches, but the rudos also got to show more of what they can do beyond stooge around for the champs. V3’s probably can do more than he’s showing in these but these also wouldn’t be close to good without him. The special opener on this show was not quite at the level as the last two, but still would’ve been a standout match in the first quarter of the year. They may a lot of the lesser amount of time they had, and it was generally another match built around a lot of spots where the spots all looked really good. Freelance looked as great as usual in his once every few years cameo in this promotion. His dives and his partners were the highlights of this match despite not much room to do them. AAA has another taping Sunday night, which should start about 6:30pm and last way too long. It should be better than the one I just watched. 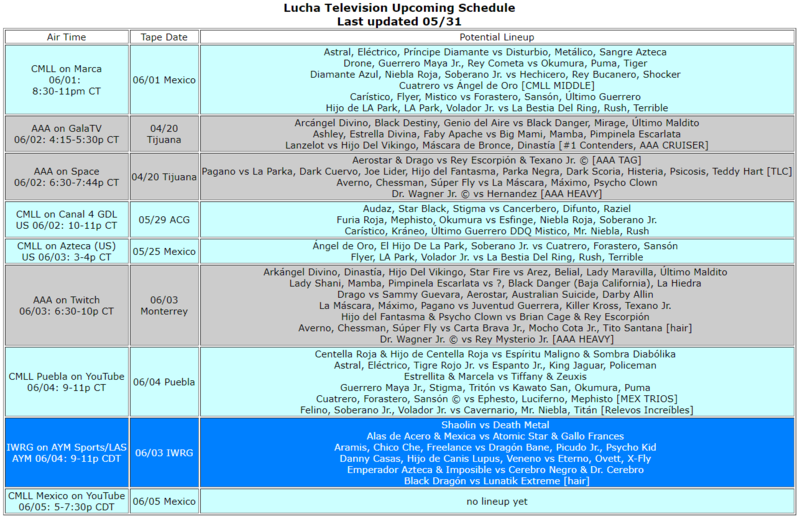 The first half of the Tijuana show also airs on Televisa, which means that opener will be up on YouTube Saturday night. CMLL has title matches Friday (Cuatrero/Angel de Oro) and Monday (Infernals/NGD). IWRG has a bloody title match.